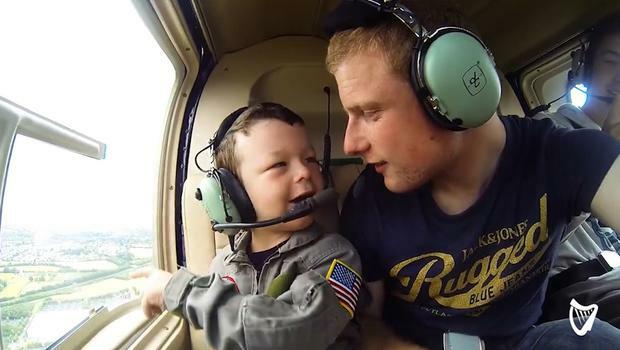 Pilot Michael McMahon deserves an award for brother of the year for the treat he gave his younger sibling Robbie, who has Williams Syndrome. Williams Syndrome is a genetic condition that is present at birth and affects around 1 in 10,000 people worldwide. Although Michael is no stranger to flying, it was very special for him to share the moment with his little bro. "Robbie had always had an obsession with Helicopters but never got a go in one," he said. "It was another aviation pleasure to get to share that experience with Robbie. ""I would spend most evenings and my days off with Robbie. He is always happy and smiling and wants to have fun all the time." This isn't the first time Michael treated his brother to a trip to the skies. Earlier this year he took him on a very special trip in a helicopter. Take a look at the heartwarming video below. "He was just excited to get up in the air," Michael said. "After a few minutes we took off and you can see how much he loved it in the video. It was a special day."